"A layered dip with white beans, arugula, and all the flavors of Tuscany." In a bowl mash beans to break the surface and blend. 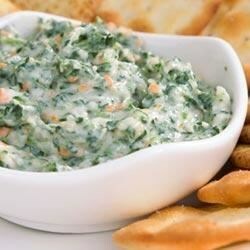 Add yogurt, tomatoes, arugula, olives, salt and pepper, mix well, let dip stand 20 minutes before serving. I did not care for this recipe. I thought it was bland and that the ingredients just didn't work together.